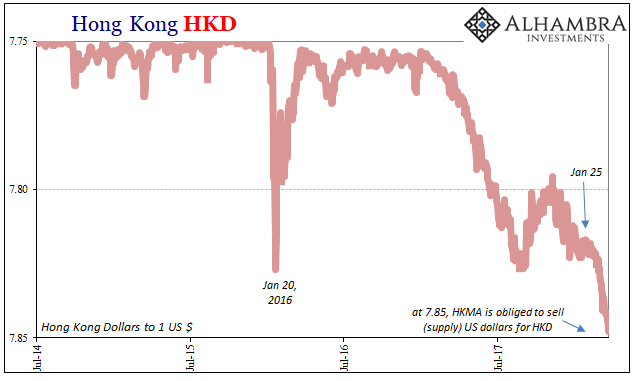 "Just A Few More Pips" - Watch The Hong Kong Dollar! In modern times, that’s been taken to extremes where officials just outright lie – nothing to see here. Inflation hysteria has subsided to a considerable degree, thankfully. Going back to January 26 or so, markets aren’t quite as ready to embrace the lie as they were through all of last year. People are now paying attention to LIBOR-OIS when all they needed was the HKMA. Less than two weeks ago, on March 8, Norman Chan, CEO of Hong Kong’s monetary authority, issued a statement. 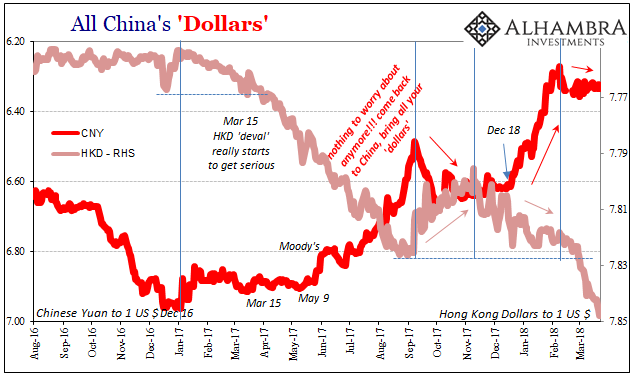 It was the usual stuff about how HK has built up an enormous reserve buffer able to withstand any convertibility issues (how’d that work out in China with their much larger pile of forex?) Further, Chan says that HKD’s vomit-inducing drop is as much a good thing as any other kind of thing. The world is getting so much better, he wrote, so HKD’s outflows are merely restoration of normality. So far so good. Many people will buy that because the logical fallacy of appeal to authority is often unquestioned. Central bankers, we are conditioned to believe, know their stuff. D’oh. Today it’s 7.848, and just a few more pips to obligated intervention, perhaps as soon as Monday, maybe even tomorrow (though I suspect they’ve been in the market already). You didn’t really need LIBOR-OIS to suggest global dollar conditions are escalating the wrong way. There was repo and collateral (including gold) in September.. 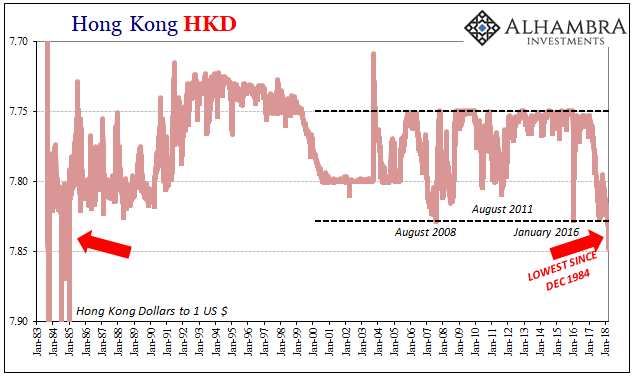 The one common trend through all of that was HKD. Why aren’t HKD traders remaining calm? For one, HKMA has never been here before. They quite literally don’t know what they are doing.